PHNOM PENH, Cambodia -- Since the morning of April 22, Thai and Cambodian troops have waged a series of heated firefights along sections of their shared border. The two sides have now traded artillery and small-arms fire for a week, leaving at least 13 soldiers dead on both sides and forcing the evacuation of tens of thousands of people from border areas. 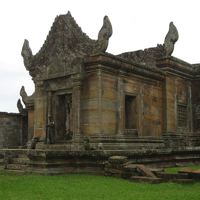 The initial skirmishes were confined to areas close to Ta Krabey and Ta Moan, two Angkorian temple ruins lying close to the border, but the fighting quickly spread to Preah Vihear, a cliff-top temple some 93 miles to the east.